Our Boatmaster Course prepares skippers for the MCA Boatmaster Tier 2 Examination. The commercial sector is now being handled by our associate operation The Boatmaster Centre. Our MCA New Boatmaster Tier 2 Course (NBML T2), which replaces the old Boatmaster Grade 3, prepares students for their examination. This course has been developed in a modular format to cater for the needs of candidates with differing requirements. The NBML T2 now requires supporting proof of service & practical competence in the form of a completed Top Lock Training can provide the exact training and/or support that clients need in preparation for their NBML T2 examination. 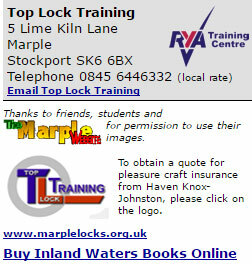 All our Boatmaster Courses are either MCA approved or accepted alternatives. Our courses are supported by personalised work folders, which are a useful document for future reference. Training can be undertaken on client’s vessels & premises provided that appropriate facilities are available. He explained how a lock works, and the correct way to use them. How to hold the windlass properly and how to operate the ratchets, avoiding damage to your fingers. He considered I was capable of handling it; was a tremendous boost to my confidence, and the highlight of the day. After this we were given plenty of chances to try mooring the boat, plus demonstrations of the different types of knots that could be used. they were all described in the excellent detailed Course Manual we were to receive later. We then went back into the house where we discussed the day and received our Certificates. Our time aboard had been excellent - we had covered a lot of ground, and I had gained mountains of confidence. Courses can be run for single people, though two is the preferred number, because you learn from each other, and you may be invited to double up. If you have no experience they recommend a two-day course, with possibly one-day if you know something about the subject.